Located just east of the quiet Ogden area of Wilmington, Figure Eight Island is a destination that has inspired curiosity for decades. Privately owned by its homeowners, and only accessible by a single bridge that crosses the Intracoastal Waterway, the island is a rumored haven for celebrities, wealthy CEOs and company owners, and any visitor who just wants a private escape. Though difficult to access, visitors who make the cut by renting or buying a vacation home on the island will be treated to one of the quietest beach landscapes in the area. As a result, Figure Eight Island retains its reputation as one of the most pristine – and privileged – vacation destinations in the coastal Cape Fear area. Figure Eight Island is a five-mile, 1,300 acre island that is located northeast of central Wilmington. The island is bordered to the north by a series of small and undeveloped islands as well as the busy vacation town of Topsail Beach, and is bordered to the south by another barrier island beach town – the popular Wrightsville Beach. The island features roughly 4.5 miles of beaches, which are bordered by skinny inlets on either side. The Atlantic Ocean serves as its eastern water border, while the Intracoastal Waterway separates the island from the Cape Fear mainland. Roughly 475 vacation homes and private residences are found on the island, and - refreshingly -not much else. There are no commercial businesses of any kind on Figure Eight Island, including shopping centers, hotels, or restaurants. The good news for visitors, however, is that ample shopping, dining and attractions are found just across the causeway in the city of Wilmington. Like most of the communities in the Cape Fear region, Figure Eight Island was “discovered” by English settlers in the 1700s. Unlike most other regions, however, once it was discovered, it never really grew. The island was first part of a royal tract of land that was given to James Moore in 1762, and the island was later passed along to Cornelius Harnett in 1775, on the eve of the American Revolution. Harnett was a signer of the Declaration of Independence, and he held on to the property for 20 years before selling it at auction to the Foy family as part of the Poplar Grove Plantation. The island remained in the family for the next 160 years or so, and under their ownership, also remained just as pristine and quiet. Interest in the island never really developed until, ironically, Hurricane Hazel. After this massive 1954 storm destroyed 15,000 homes along the coastline, beach property was available at a song, simply because people feared that local island homes wouldn’t last. A pair of investor brothers, Dan and Bruce Cameron, took advantage of this situation, and began the process of purchasing the island from its then-two owners, (George Hutaff and the Foy family), in the hopes of eventually creating a private vacation destination. They were successful in their efforts, and they bought the entire island in 1955 for just $100,000. Despite their initial coup, the island remained dormant for the next 10 years or so, as more investors signed on and began plotting the “new” community that was to be created. A bridge was built, which cost $150,000, or 50% more than the island itself, and was eventually replaced with a new and stronger bridge in 1980, which was actually a second-hand structure that originally hailed from Port Royal, Virginia. Interest in the island’s development would ebb and flow in the latter 20th century, with recessions, financial issues, and bankruptcies leading to a string of different owners. Lot sales were initially high in the early 1970s, but slowed to a crawl with the downturn of the economy just a couple years later. Eventually, the property owners at the time - Figure Eight Development Company - went into bankruptcy in 1974, and the island was effectively sold at auction on the courthouse steps. It eventually landed in the hands of the Figure Eight Homeowners’ Association, which has technically “owned” and managed the island ever since. The island really started to draw attention in the 1980s and 1990s, when rumors flew in the Cape Fear area of the many celebrities who flocked to the destination for a private vacation. Famous visitors who paid a visit to the island include Dustin Hoffman, Gene Hackman, Debra Winger, Nick Nolte, Kim Basinger, and Alec Baldwin, just to name a few, and in the late 1990s, even then-Vice President Al Gore vacationed there with wife, Tipper. Today, the island remains an elusive community and a hidden jewel along the beach, with stunning vacation homes and residences and wonderfully nothing else. Still a hotspot with celebrities and industry movers and shakers, a vacation on Figure Eight Island is like no other experience in the Cape Fear area. 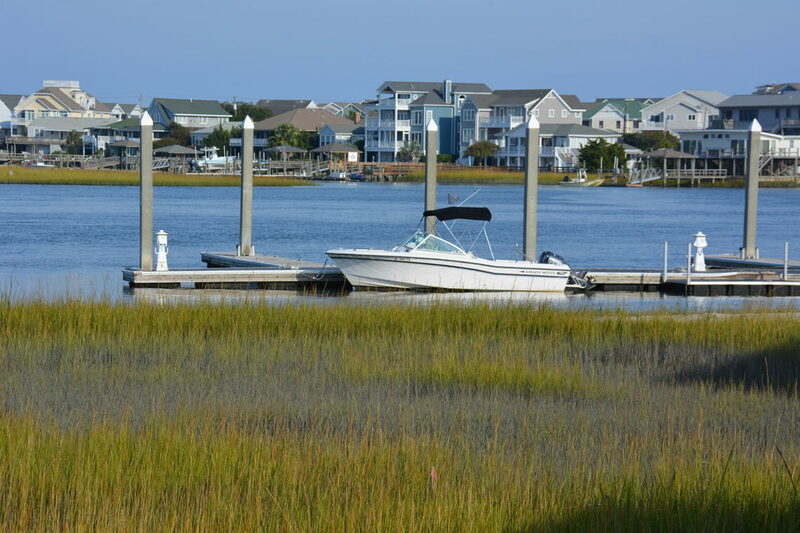 The only way that visitors can access Figure Eight Island is by renting or purchasing a vacation home or residence. The only bridge to the island is guarded 24 hours a day, and a pass is required for vehicles to cross and access the island. The good news is that weekly vacation homes are available through a local property management company called Figure Eight Realty. These homes can range from three bedroom residences to eight bedroom sandcastles, and can include a long list of amenities such as private boat docks, swimming pools, elevators, hot tubs, game rooms, and much more. Additional rental options may be available via an individual homeowner directly as well, through national vacation home rental websites like HomeAway or VRBO. For more information on vacation rentals, including prices, available dates, policies, and features, visitors can peruse the Figure Eight Realty website at http://www.figure8island.com/. There might not be any restaurants, hotels, or massive resorts on Figure Eight Island, but that doesn’t mean that visitors won’t find a natural supply of things to do. Make your vacation wonderfully relaxed and wildly enjoyable by ensuring these on-island activities are on your Figure Eight Island vacation agenda. Shelling – The Figure Eight Island beaches are perfect for shell hunting, simply because of their isolation. Head to the quiet northern and southern edges of the islands, close to the inlets, for an opportunity to find whelks, sand dollars, coquinas, scallops, olive shells, and even Scotch Bonnets that may wash in with the incoming tides. Fishing – Surf fishing is a popular pastime on the island, and there’s ample elbow room to cast a line from the beach. Pick up a saltwater fishing license before you arrive, (as required by NC state law), and get ready to reel in a variety of seasonal catches like bluefish, flounder, red drum, mackerel, trout, mullet, and more. Swimming / Surfing – Like most Cape Fear area beaches, the shorelines are nice and wide, with a gradually sloping ocean floor. As a result, it’s a great spot for swimmers and beginning surfers who want to take advantage of the ample space and traditionally gentle waves. Visitors should note, however, that due to the lack of crowds and lifeguards, caution is required when entering the ocean. Kayaking – Head to the “soundside” to discover a network of calm and shallow channels of waters that cut through beautiful marshes and pristine landscapes. Ocean kayaking is also popular – and accessible – on Figure Eight Island, due to the gentle waves and shallow shoreline. Birdwatching – Visitors can head to the northern and southern tips of the island, or to any spot along the soundside, to enjoy fantastic vantage points and plenty of seasonal wading birds and shorebirds. Look for egrets, ibises, and herons along the western edge of the island, as well as plovers, terns, and pelicans along the ocean-facing beaches. Biking – Because of the lack of traffic and network of side streets and paths, biking is a very popular activity for area explorers. Set off on a leisurely adventure and discover a collection of cool coastal landscapes along the way. Boating – Virtually every vacation rental along the “soundside” has a boat dock, which can accommodate smaller vessels like skiffs. Enjoy an easy run to the Intracoastal Waterway, the Atlantic Ocean, and a collection of cool waterways in between. Rates for vacation rentals on Figure Eight Island are often seasonal, which means that the prices are at their highest during the peak summer months, and are lower during the shoulder season months of spring and fall. Virtually all vacation rentals can be booked online before a vacation, making it an easy process to secure a place to stay months before a visitor arrives. Be sure and book early! Weeks can fill up quickly, as Figure Eight Island is rapidly becoming a popular vacation destination for families of all varieties. Some larger properties may be available for special events, such as private weddings or corporate retreats. Call your vacation rental provider ahead of time to see what restrictions or extra fees may apply. Love Figure Eight Island? Then consider buying a home. Properties come up for sale occasionally in this coveted island destination, and a local Cape Fear area Realtor can help potential buyers find – and acquire – their dream property by the beach. Figure Eight Island has long been heralded as “North Carolina’s Best Kept Secret,” and it’s easy to see why. Quietly located close to all the Cape Fear area’s attractions, but truly in a world all its own, this pristine beach vacation destination is the perfect retreat for any visitor who believes that privacy, relaxation, and stunning natural scenery is what an ideal Cape Fear getaway is all about.